How Many Chinese Dialects Are There? In Chinese the word for dialect is fāng yán which literally means “place speech” so technically there are as many dialects as there are place names. Any province, county, city, district, town or village can have the word huà attached to it to mean the speech of that place, and by Chinese standards that would be considered a different dialect. Okay, but how many actual different dialects are there? Some of the so called fāng yán are so close that they’re more like different accents. At other times they can be so different that they’re more like different languages. But most Chinese people will still call them different fāng yán or “different dialects” when speaking English. Exactly at what point a different accent with some slang thrown in becomes different enough to be a separate dialect, and the point at which a dialect can be considered a different language is largely subjective. For example, the difference between Chinese Mandarin and Chinese Cantonese is probably much larger than the difference between Portuguese and Spanish, yet Mandarin and Cantonese are considered dialects of Chinese whilst Portuguese and Spanish are different languages. Similarly, the Dutch language is probably closer to High German than Low German is, yet Dutch is considered a different language whilst Low German is not. Just get to the point! Exactly how many dialects are there? Despite the subjectivity linguist have to draw the line somewhere, although not all linguist have drawn their lines in the same place. The modern categorisation of Chinese dialects began with Western linguists and missionaries in the mid-19th century, and since then there has been much debate. Today the generally accepted number is seven. What? Only seven? You’ve got to be kidding me! Wait, did you just say that Mandarin is a dialect? Yes. Mandarin is a dialect. The Chinese standard language pu tong hua is often incorrectly translated as Mandarin. pǔ tōng huà is actually standard Mandarin. Mandarin is a dialect called guān huà in Chinese, of which pǔ tōng huà is the standard form. Most Chinese people will be unaware of the seven dialects unless they have studied languages or linguistics so don’t be surprised if you’re Chinese friends have no idea what you’re talking about when you tell them about guān huà. By reading this article you may well know more than they do. How on earth do linguists categorise them? This really requires a whole separate article to explain fully. Unless you’re a linguist yourself some of the criteria might not make much sense either. For example, one of the features of Mandarin is the lack of voiced stops, whilst the Wu dialect has no diphthongs, Min dialect has few aspirated consonants… lost you yet? Other criteria include the number of tones. Mandarin dialects all have four or five tones, whilst the Wu dialects usually have seven or eight. Cantonese dialects also have eight but they’re not the same as the Wu dialect tones. Grammar is also a factor. Mandarin dialects don’t distinguish between the preverbal and existential negative but Wu dialects do. As I said, this is only the tip of the iceberg and a full description would require a long (and probably quite boring) post of its own. So there are seven dialects, that’s it then? Not exactly. The distinction between dialect and language is somewhat subjective (I know I’m repeating myself now). In many ways the “seven Chinese dialects” are more like the “seven Chinese languages” and within each there are also many mutually incomprehensible dialects. The reason why Chinese people insist on calling them dialects is probably as much to do with nationalism as anything else. 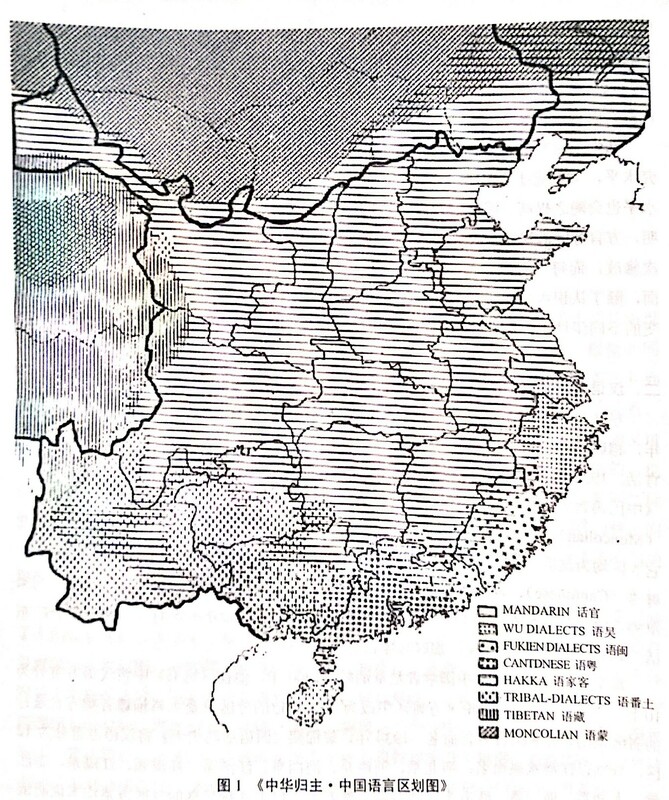 Calling them the seven dialects of Chinese rather than the seven languages implies unity. Imagine if the Roman Empire never collapsed and as a result Italian, French, Spanish and Portuguese were all officially considered dialects of Latin. There are of course dialects within the Latin languages (Catalan springs to mind) and similarly there are dialects within the Chinese languages (or dialects/ dialect groups/ whatever you want to call them) Even within Mandarin or Cantonese there are mutually incomprehensible variants. But Mandarin is the original Chinese language, right? Wrong. In fact quite the opposite, generally speaking the further south you go in China the closer the dialects become to Chinese as it was spoken 1000 years ago during the Song dynasty (known as middle Chinese) Mandarin is a relatively new variant of Chinese that is heavily influenced by the Mongolian and Manchu languages. In this respect Mandarin is actually the least pure form of Chinese. Go on then, tell us which dialect is most difficult. As with learning foreign languages the most difficult dialect really depends on what your first language is. For example if you want to learn the Hong Kong dialect then it will be a lot easier if you can speak the Guangzhou dialect since they are both variants of Cantonese. Having said that, Chinese people often consider the Wenzhou dialect, a variant of Wu, to be the most difficult. In fact it was used by the Chinese as a secret language for military communications during the Vietnam War in the same way that the US military has made use of native American languages and the British military uses Welsh. Not only did I spend a lot of time writing this, I also had to spend a lot of time reading. So if you liked this post please click like and/ or leave a comment, post on Facebook etc. It really will make my day. This entry was posted in Chinese linguistics, living in China and tagged Chinese, dialects, mandarin. Bookmark the permalink. This is a very good article and well documented. I would add the the concept of dialect is different depending on the angle with which you see it. For instance from an administrative point of view any language naturally spoken by chinese citizens would be a “fangyan” , even languages completly unrelated and recognized by the scientific community as independant languages groups like zhuang or ouigour would be considered “fangyan”. For linguists likes to classify dialects and language based on how much they are similar they will have a very different opinion on the matter. And once one explain the difference of angle to a chinese person this very chinese person will be much more eager to listen and accept that new angle. And so Chinese languages or more precisely sinitic language family is classified by dialects continuum, if a dialect continuum have the chance to get a “presitigious variation” the dialect group will be likely considered a language as for example Cantonese is the english colloquial name of the Yue, Yue will be the general name for it the standard variation will be based on the dialect of Guangzhou but you will have variations like the Jiang Men dialect the Hong Kong dialect etc. So from a linguistic point of view it is not wrong to call Yue a language. And eventually the continuum of Gan or Wu dialect correspond to a Wu language, probably it “standard variation” would be the dialect of Shanghai. Usually languages and dialects are defined by a certain set of shared features. This features can be a Common shift of consonant (think about the Grimm law for germanic languages for exemple) , a vowel reduction of other inovations shared within the group. For which “Chinese dialect” is the hardest it’s interesting that you talked about the Wenzhou dialect, as it is one of the Chinese languages that retained a lot of the features of the languages of “pre-han” China. Lot’s of the words actually doesn’t come from the sinitic family any it’s with quite some irony they used it in the episode of Vietman war as it’s actually not impossible that these words comes from a language related to Vietnamese. Hope the comment isn’t too much repeating what you already say. Why no mention of Chinese (Traditional) and Chinese (Simplified)? Those are the only two that I can translate an email into or from. Hi George, thanks for the question. Chinese Traditional and Simplified are different writing systems rather than dialects. You can write Mandarin in both simplified and traditional characters (in Taiwan traditional Chinese characters are used, in Mainland they use simplified). It’s basically two ways of writing the same thing, a bit like how American and British English sometimes have different spellings. When you translate something from Chinese Traditional to Simplified it is a bit like writing a document using American English spelling and then running a British English spell checker that changes the spellings to British English. In this post, different dialects is referring to differences in grammar, vocabulary and phonology. Hope that helps.